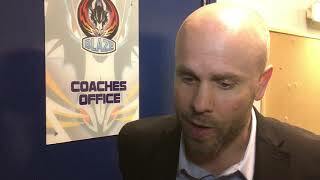 The Genting Casino Coventry Blaze produced a stunning come-back, scoring two late to grab a point in their Elite League opener against the Nottingham Panthers at the Skydome Arena. The away side, in front of a healthy following opened the scoring early (1.31) through Mark Hurtubise, the former Edinburgh Capital stand-out's first of two on the night. Making his home debut, Blaze Man of the Match (his second of the weekend), Tim Crowder levelled the scoring at 15.50, later registering again to begin the late come-back. With no goals in the second period, the incident of note came on 12.35 when British pair David Clements of Coventry and Robert Farmer of Nottingham came to blows. A second fight followed in the third period with Panthers' Jacob Doty picking up the instigator penalty following a hit by Blaze Captain Kevin Morris (53.52). Tim Billingsley hit the first of six third period goals to give the visitors a 1-2 lead (44.29). Luke Ferrara tied the game at two (47.27) before Hurtubise bagged his second gave for 2-3 (50.39). On 56.48, it looked the game was over as Alex Guptill make it 2-4 for the Panthers. A dogged Blaze team had different ideas though, Crowder (57.45) scoring his second before Kelin Ainsworth sent the Skydome Arena into raptures tying the game 4-4 on 58.09. A free-flowing overtime period saw no scoring, sending the game to a penalty shoot-out. 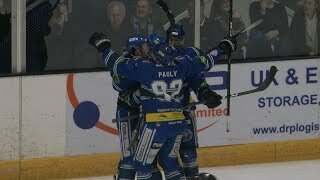 Despite Blaze taking an early advantage, it was the Panthers who skated out successfully out-scoring Coventry 2-3 over the five shots.